Just 32 miles west of Dallas, Fort Worth is often overshadowed by its sister city, although it is full of major tourist attractions and is actually the home of the Dallas Cowboys NFL team. 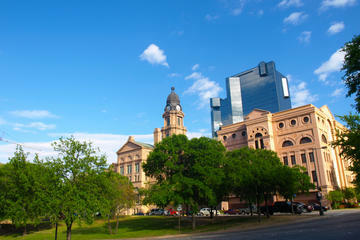 Nicknamed "Cowtown" for its deep roots in the cattle ranching industry, Fort Worth is home to the celebrated Stockyards National Historic District. Full of old-west themed entertainment and shopping, it also has several museums dedicated to the old ranches to give tourists a feel for the authentic cowboy life. Today, the city welcomes nearly nine million visitors annually, who come for work and play, enjoying Fort Worth's wide range of things to do. In addition to historic sites, Fort Worth is home to several art museums, beautiful public spaces including the oasis-like Water Garden, entertainment venues like Bass Performance Hall, and shopping galore in areas like Sundance Square. The city is also known for its diversity and dedication to human rights, having been one of the first Texas cities to establish its own non-discrimination laws. Established in 1866, Fort Worth Stockyards National Historic District owes its fame and unique character to the cattle industry. The last big stopover on the Chisholm Trail - and the last remaining historic stockyard in the United States - it once saw millions of cattle pass through. Today, the area has been transformed into one of Fort Worth's biggest tourist attractions and takes visitors back to the days of the great cattle round-ups with all kinds of entertainment and fun things to see and do, from rodeos to live music shows, museums, and western-themed shopping. Some of the old cattle driving traditions live on, and volunteers can still be seen demonstrating the art; for those wanting to try their hand at being a cowboy or cowgirl, a number of fun horse treks are available. 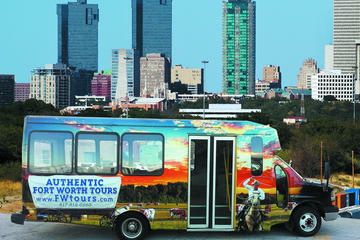 Start your adventure at the Stockyards Visitor Center or the Stockyards Museum in the Livestock Exchange Building. Located in downtown Fort Worth, adjacent to the Convention Center, the Water Gardens are far more than simply a collection of pretty fountains to gaze at. Designed to allow visitors to cool themselves in the flowing water, they are a refreshing contrast to the hot urban landscape of this southern city. The Water Gardens were built in 1974 and feature three pools throughout a 4.3-acre park. The largest of these is called the "active pool," a 38-foot-tall terraced area that is used by waders as steps while the water flows across the stone and into a central pool. The "aerating pool" is a collection of fountains that sits beneath the shade of towering oak trees, especially beautiful at night when it is lit up. The "meditation pool" is a peaceful place that is cordoned off by cypress trees, while water slides down sheer walls into a calm, blue pool. Established in 1909, Fort Worth Zoo got off to a humble start with just a handful of animals, but over the years it has grown into a world-class facility with hundreds of species from around the world, including 68 endangered and threatened species. This is the only zoo in the United States that houses all four species of Great Ape (chimpanzees, gorillas, bonobos, and orangutans). It also has one of the world's most successful flamingo breeding colonies and is one of only five zoos worldwide to have two of the five rhino species. Other zoo residents include favorites like penguins, cheetahs, African lions, giraffes, meerkats, hippos, and even elephants with their babies. In addition to its diverse range of animals, the zoo has several attractions, including the Country Carousel, rock climbing, the miniature Yellow Rose Express Train, a petting zoo, and a 40-foot-long statue of an iguana nicknamed Iggy. Established in 1961 to host a collection of artwork by Frederic Remington and Charles M. Russell, the Amon Carter Museum has expanded considerably over the decades to encompass all facets of American art. Today, visitors can see numerous paintings, photos, and sculptures, along with excellent temporary exhibits. Highlights include examples by landscape painters of the 1830s to modern artists of the 20th century, featuring such greats as Alexander Calder, Thomas Eakins, and Alfred Stieglitz. One of the city's most popular tourist attractions, Fort Worth Botanic Garden is spread over 109 acres and is a great place to visit any time of year. Established in 1934, it is home to 2,500 species of plants laid out in 23 unique gardens, with highlights like the Fragrance Garden, the Rose Garden, and the Rain Forest Conservatory. One of the most popular is the idyllic Japanese Garden, a peaceful 7.5 acres of magnolias, cherry trees, bamboo, and other traditional flora, with lovely paths that arch over footbridges and past ponds full of koi. The center also has special projects, including the Begonia Species Bank, a living collection of begonias designed to help maintain the species, as well as water conservation projects with an entire garden dedicated to sustainability. The Botanic Garden also hosts interesting programs, like adult educational programs and kids' workshops, and has dining on-site with garden-view patio seating. One of Fort Worth's most popular destinations for visitors and locals alike is Sundance Square, a privately owned, 35-block section of the historic downtown core that is full of things to do. Consisting of a mix of residential, commercial, retail, and entertainment buildings and named after the infamous outlaw, the Sundance Kid, the area is safe and fun to explore on foot thanks to its many pedestrian zones. In addition to restaurants, cafés, and hotels, Sundance Square contains many excellent shopping opportunities, from high-end boutiques and interesting art galleries to large department stores. It's also a vibrant cultural center, home to a number of important museums including the Sid Richardson Museum with its collection of works by one of the country's most revered "cowboy artists," as well as theaters such as the Bass Performance Hall and the Circle Theater with regular drama, music, and dance performances. The centerpiece of the district is Sundance Square Plaza, a vast public square boasting fountains and seating, as well as a stage used to host live concerts and other entertainment. The Kimbell Art Museum is an architectural delight, designed by Louis I Kahn and opened in 1972. The museum's creative use of natural light is particularly interesting, and wandering the grounds is a fine way to spend time, particularly at dusk. Although small, the museum's collection features a number of important pieces from a variety of periods, ranging from 20th-century art to age-old antiquities. Highlights include paintings, sculpture, and pottery from Europe, Asia, and Africa, and the museum hosts regularly changing and traveling exhibits. The Kimbell also offers a number of educational programs and has a small restaurant. A must for art lovers, as well as fans of the Wild West, the Sid Richardson Museum displays artwork compiled by collector Sid Richardson between 1942 and 1959. Housed in a replica of an 1880s building, the museum consists primarily of works by American artists Frederic Remington and Charles M. Russell, who famously captured the spirit of the west in their late 19th- and early 20th-century paintings. The collection's pieces show the action, drama, and scenes of daily life in the historical west, including many fine examples by lesser-known artists. Highlights of a visit to this free museum are fun educational programs and themed guided tours. The Modern Art Museum of Fort Worth focuses on post-WWII art, with a large permanent collection of 2,600 modern and contemporary pieces in a variety of media. Some of the more famous names represented are Anselm Kiefer, Pablo Picasso, Jackson Pollock, Gerhard Richter, Susan Rothenberg, and Andy Warhol. Designed by Tadao Ando, this unique complex, with its five pavilions of concrete and glass, overlooks a one-and-a-half-acre reflecting pond around which is a sculpture garden and terrace. The museum is a fine addition to Fort Worth's Cultural District and is close to the Amon Carter Museum of American Art and the Kimbell Art Museum. In addition to its rich artistic heritage, Fort Worth isn't shy about celebrating its role as the gateway to the once-Wild West. One of the most important of these establishments is the National Cowgirl Museum and Hall of Fame, a tribute to the women of the American West who distinguished themselves and exemplified the pioneer spirit, including cowgirls and ranch women, writers, artists, teachers, and entertainers. Among the best known inductees are sharpshooter Annie Oakley, singer Patsy Cline, and artist Georgia O'Keeffe. Other highlights include biographies of prominent rodeo cowgirls and depictions of everyday life for women who lived and toiled in Texas's early years. Equally important is the Texas Cowboy Hall of Fame, which focuses on the men and women of the rodeo circuit, and the National Multicultural Western Heritage Museum, highlighting the contributions of other groups to the building of the west, including those of Hispanic, European, African, and Native American descent. Fans of flying machines have much to get excited about when visiting Fort Worth. First stop should be the Vintage Flying Museum at Meacham International Airport, a superb collection of vintage aircraft offering a chance to fly aboard a historic WWII-era DC3, as well as seeing up close iconic aircraft, such as a B-29 Superfortress. Also worth seeing is the Fort Worth Aviation Museum, home to a vast collection of US made aircraft, and the American Airlines CR Smith Museum, with its displays and artifacts relating to the history of one of the country's largest airlines. Opened in 1945, the Fort Worth Museum of Science and History features many excellent hands-on educational exhibits related to science, technology, and natural history. Really five museum collections under a single (large) roof, it includes highlights like the Fort Worth Children's Museum, a place for kids under eight to play and learn, and the DinoLabs and DinoDig exhibit, portraying the story of dinosaurs in the state, complete with a replica of a dig site. Of particular interest is the Cattle Raisers Museum, dedicated to the importance of the cattle industry. Be sure to take in a show at the on-site planetarium and IMAX theater. Fort Worth's Log Cabin Village is a fascinating living history museum featuring a number of original 1800s buildings salvaged and moved to this location from across the state. Furnished with authentic artifacts and each fashioned in a unique theme, these fine old buildings include a water-powered gristmill, a one-room schoolhouse, a blacksmith shop, and several old log homes. The effect is enhanced by costumed interpreters re-enacting the lifestyle of Texans from this early period, and fun interactive events in which visitors can participate, such as planting, enjoying games and activities, and listening to live entertainment. Widely regarded as one of the best theaters in Texas (if not the US), the Nancy Lee and Perry R. Bass Performance Hall - usually simply referred to as the Bass Performance Hall - opened in 1998 and is well worth a visit. Built in a distinctly European style, this majestic limestone opera house in Fort Worth's Sundance Square district was named after the donors who largely financed its construction and has since become the city's most iconic structure. In addition to the two 45-foot-tall sculpted angels adorning its exterior, the building is crowned by a dome measuring 80 feet in diameter and has a sumptuous interior adorned with fine artwork. If you can, try to time your visit to coincide with one of the theater's regular performances, whether it be classical, operatic, or pop music, a ballet or drama production. Luxury Hotels: The sleek and modern Omni Hotel, offering first class service and amenities, is in the southern part of downtown, across the street from the Fort Worth Convention Center and the Fort Worth Water Gardens. Housed in a building on the National Register of Historic Places, The Ashton Hotel is a boutique establishment, just steps from lively Sundance Square. The Hilton is a Fort Worth landmark hotel, built in 1920, and the place where President and Mrs. John F. Kennedy stayed the night before he was assassinated in Dallas. Mid-Range Hotels: At the top-end of the mid-range bracket is the Embassy Suites, with large rooms and a great location in the Sundance Square area. Molly the Trolley stops right outside the hotel's front door. Also in a good location and offering a free five-mile shuttle is the TownePlace Suites. The Holiday Inn Express, on the west side of downtown, is just a five-minute drive or pleasant walk through Trinity Park to a number of museums and also offers a free shuttle service. Budget Hotels: The best budget hotels tend to be about a 10-minute drive outside the downtown core. The brand new La Quinta Inn & Suites Fort Worth Eastchase is perfect for sports fans, with the AT&T Stadium just over three miles away. The Best Western is west of the city center and is surrounded by a selection of restaurants. North of the city, the Comfort Inn offers large rooms and good value. All of these hotels have outdoor pools.